A brief overview of current SMB requirements and challenges. How the cost and operational benefits delivered by cloud-based business application solutions have propelled these solutions into mainstream business and technology practices. 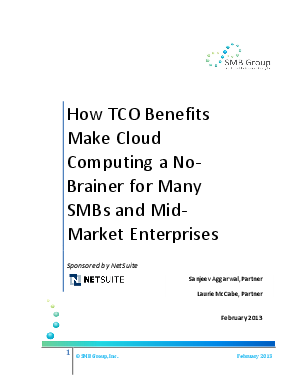 TCO for planning and design, infrastructure hardware, software and support, application software, deployment and training costs of traditional on-premises business applications versus cloud business applications offered by NetSuite, a leading cloud solution vendor. Recommendations for SMB customers who are evaluating these alternative computing models.